Rarely in life do things gobetter than expected, and often times WORSE as the case when I recently hauled out my boat to have initially just the bottom painted and zincs replaced. Imagine the HORROR seeing my props literally crumbling apart as my boat was being hauled out. I was the victim of “Stray Current” at my Marina. My boat is a Rodman 870, built in Spain with NO dealers left in the U.S…..everything is metric on the boat including the props & shafts. So now I have a foreign built vessel in need of 2 “Custom Metric” props with NO U.S. dealers. 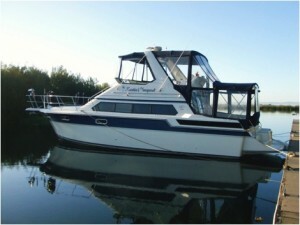 Compound this with the fact I’m paying the boat yard $30.00 a day for my vessel to be on blocks…..WHAT TO DO???!!!!…. 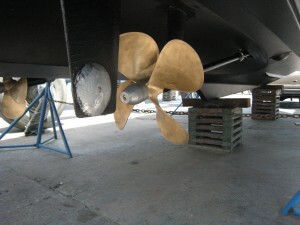 I make numerous calls to boating friends/experts & the same name in Quality Workmanship, Pricing, Turn-a-Round Time keeps getting repeated…..Thomas Marine Propeller. So I make a call & talk to the owner Steve.I have a very pleasant, informative,educational conversation with Steve…agree on a “Very” fair price….a “Very” quick manufacturing/ turn-around time….& submit my order. Like a kid at Christmas time, I am “Jumping with JOY!! !”….when the UPS driver arrives with my props….open up the boxes & am almost BLINDED by the SHINY brass propellers, I’ve seen Japanese Sushi knives that weren’t as sharp as the edges of my propellers. Installation was a breeze as well as the fit & sizing…..now for the BEST PART!!! !…..the props are Soooooooo WELL engineered & balanced….I’ve picked up 3knts at 300 LESS rpms at 20 knots with my twin Volvo 150 HP diesels….So…I’m going FASTER , using LESS rpms, &, LESS fuel!!! !…..which is HUGE, considering diesel is $4.00 a gallon. I DON’T KNOW….what kind of Voodoo, Black Magic is taking place in the laboratory of Thomas Marine Propellers….but whatever it is…..I’m a “TRUE BELIEVER”!!!!!!……. 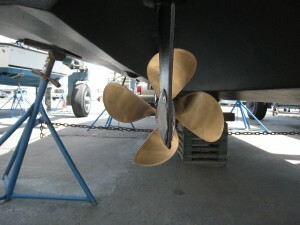 Again I would like to thank you for the excellent work you did on my propellers. In fact they looked so nice it was questionable if I should put them in the water under the boat. However I did have Nick put them back on. When finished I headed out fourteen mile slew for the channel. Once on the channel I took my boat up to what sounded to me from past times to the speed of 9 knots. When I looked at my tack I was going 13-1/2 to 14 knots. After adjusting to that pleasant surprise I focused on boat vibrations but could not feel what I thought was normal prior to the propellers being tuned. 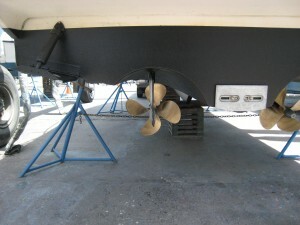 What you told me about the CUPPING of the propellers also made a large difference in what the boat did when I pushed the throttles forward. There was not the same size hole for the stern to drop into as before. Last but not the least is the engine noise was more quiet now. Thank you for taking the time to explain and show me what the propellers were and where they are now. against the bow wave but wouldn’t get on plane. maximum rpm in each engine. For the first time in the boat’s life, it now gets on plane. 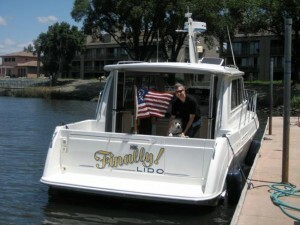 Another happy customer; Jerry Brooks runs a “Six Pack” charter service out of the Santa Cruz Yacht Harbor. Hi Steve, thanks for getting back to me. The prop is unbelievable. I gained 4kts at the same rpm I was normally cruising at. Plus it smoothed out almost all vibrations. Next year I think I’ll put in a new prop shaft also. It has some pitting starting to show, and I think thats where the tiny bit of vibration I get is coming from. I couldn’t be happier. Your the man. If I could, I think I would make you a Saint. I want to order up a back up prop also. I have the print out you sent me, and when I’m ready I’ll give you a call. Thanks again. I just wanted to let you know I took the boat out for a short ride yesterday and the prop worked great. I’ll be taking it out for a longer ride this coming weekend to verify everything is OK. I made about 16kts at 3100 RPM which is where I should be. As far as WOT it made about 3650 RPM, same as the old prop. Thanks for your great service! I appreciate working with someone that knows what they are talking about. I will pass along your shop name to anyone I know needing prop service. Lee is Captain of the John Martin, a research vessel used for various projects by Moss Landing Marine Labs in the Monterey Bay. Hi. The props worked great. After repairing the port prop the second time (ouch!) we once again have no discernible vibration from the running gear. This has not been the case in the past couple of years so we are very pleased with the PROP-SCAN based technology. I think we can safely say that the boat has never run so smoothly and is most likely quicker, but this last is hard to pin down as we did some hull modifications at the same time that you trued the props. Nevertheless, we are getting 18-19 knots at 1800 turns which is good performance on this boat as she is presently configured. She is roughly 55X17 feet and displacing 30 tons or so. The boat is running a little heavy due to our having installed a flying bridge, mast, A-frame, oceanographic winch and swim step since she came into our possession.